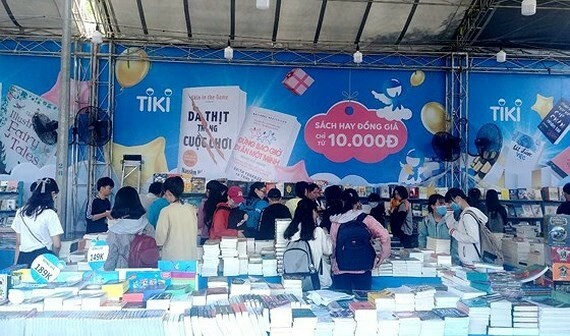 The third Can Tho Book Festival in Luu Huu Phuoc Park in the Mekong delta City of Can Tho’s Ninh Kieu district earned VND12 billion ($516,875 ) from on March 25 to March 31. This year, the book festival with the theme “Books, Knowledge, Development and Integration” attracted more than 400.000 visitors. The week-long event attracted approximately 299 display booths of 89 publishers and books distributors, including five foreign publishing houses of the US and the UK. The festival introduced to readers 196.000 books with more than 2,3 million copies including 60 percent of new copies of literature, history, science. Fahasa, Tiki, Nha Nam, Alphabooks, Hong An, Kim Dong are some well-known publishing houses at the festival. In addition, visitors have chance to meet their favorite authors and have their signature. What is more, the organizer received gifted books worth VND150 million from 18 individuals and publishing houses. The books will be given to cultural post offices, libraries and schools in countryside areas.